My favorite breakfast cereal is Kellogg's® Raisin Bran. 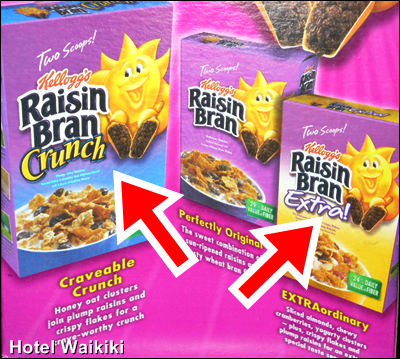 According to the back of the box Kellogg's now produces two other versions of Raisin Bran. "Extra," with nuts and cranberries, etc., and "Crunch," with honey oat clusters. For the record, I'm sticking with the original Raisin Bran. I don't know what the marketing strategy is behind producing multiple versions, flavors, of the same food product but it seems to be a trend on the grocery store shelves. With bacon. With wasabi. Potato chips are the most notorious in this genre. 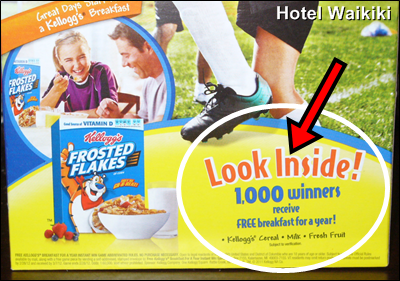 Kellogg's® Frosted Flakes also happened to be on sale so I bought two boxes of the Frosted Flakes to store away in the pantry, and double the possibility of instantly winning "FREE breakfast for a year." Need I mention that I neglected to reach for that Snicker bar in the process, and as things would have it, no prize nay mega lottery. But that's how it is on some days. 1,000 winners out how many tens of thousand boxes? Good gracious! I haven't had Frosted Flakes in forever. It used to be my favorite cereal as a kid. Now it would be very detrimental to my glucose level. Too bad about not winning.... Sigh. I never have any luck with those. Tried the Crunch variety recently and I gotta say I prefer that over the original. I don't think I'd care for the 'extra' variety, but the 'crunch' one sounds nice. I do like Raisin Bran, except how it all gets stuck in my teeth, but that's what a toothbrush is for. I never have any luck with winning that sort of thing either. I think when I was about 16 I might have won a free bottle of Coke on an instant win thing where the prize was under the cap. Nate- "I went on a hunch." LOL, still better than those people who go to Vegas and brag falsely that they always win. Kay- I'm gluing the box back together, and returning it to the stoah. Cloudia- did you get the message I sent you in the bottle from upstream on the Ala Wai canal. Should have reached the yacht harbor by now. Anonymous- I'll have to give that version of Raisin Bran a try. 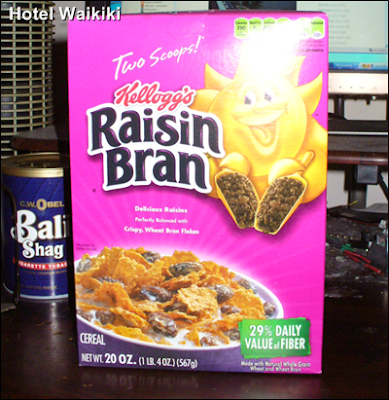 Brad- one of the reasons I buy Raisin Bran is that raisins by themselves are so darn expensive. 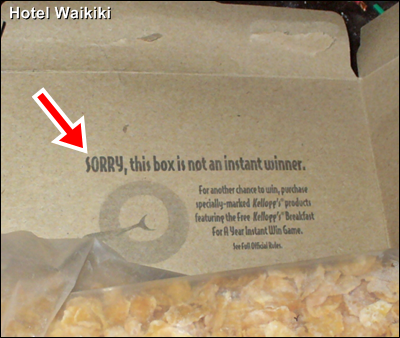 If that's the case, then you have to ask yourself if the raisins in the Raisin Bran are really raisins. Brad- I just checked the "nutritional facts" printed on the box, and it does say "raisins." You had me worried there for a second. Never hurts to check. Not these days. Me, I used to love Frosted Flakes and Rice Krispes growing up, but in the past 15 years or so I enjoy Grape Nuts. Nate- know something, I've never ate Grape Nuts. I guess I'm not too much into Post® brand. I love Raisin Bran almost as much as I love Golden Grahams. I never eat the latter because of the sugar, and rarely eat Raisin Bran.. same thing. However, sometimes a bowl of Raisin Bran makes a love supper!